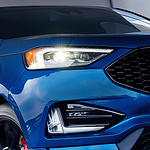 While the new technology features and safety systems help to improve your driving experience, the look and feel of the Ford Edge ST helps make you look good driving down the road. The Edge ST is enhanced with a rear spoiler, polished stainless steel dual exhaust tips, and solar-tinted window glass. We at the Lithia Auto Stores would be glad to show you all that the new Ford Edge ST has to offer you.